This last Sunday we had our first drizzle of the year here in Jozi. As the barometer was forecasting gloom and doom I decided to traipse around my local school club dam and pick up some feathers left from the local bird life. I managed to come away with guinea fowl, mallard, Egyptian Goose, hadeda and sundry duck feathers. In addition, in order to create a more exotic Mzansi look I also dug out from my fly tying room a Woolies bag worth of Greywing Francolin feathers that my Eastern Cape wing shooting mate had kindly given me. For soft hackles the female bird plumage is usually softer but less colourful than that of the male. The feathers on the neck, chest and 'coverts' are ideal as the hackle for spider flies. A few fibres from the primary and secondary wing feathers of larger birds such as the hadeda and Egyptian Goose make wonderful 'quill' bodies. 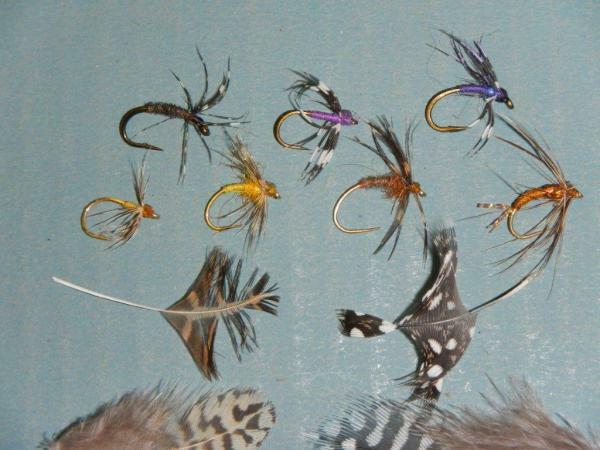 I've taken the soft hackle fly AKA spider design as an example of what can be done using random feathers. - lead underbody, glass beads or weighted beads. The middle top Guinea and purple is tied on a special Partridge size 16 'Spider' hook. 2) Tying thread - you can use standard thread of any colour to suit. do a great silk thread in a myriad of colours for a reasonable price. 3) Body - top left fly is greyish-purple hadeda herl ribbed copper wire. Centre and right top with purple thread and a bit of UV purple ice dub at the thorax. Bottom flies tied using gold hooks (just for fun) with yellow tying thread and UV yellow ice dub thorax. Right two using Egyptian goose herl ribbed copper wire and a bit of copper UV dub. The one on the right also has a piece of pearl flash on the tail to imitate an emerging caddis pupa. 4) Hackle - top three guinea fowl. Bottom left hand two francolin grey breast, bottom right brown francolin neck. See below feathers, left francolin and right guinea for how to prepare them and tie in by the tips with convex 'outside' size facing front. You can of course get 'Step By Step's off the internet and space does not permit showing same here. You must tie the flies thin with sparse hackles. One or two turns is sufficient. If you put on too much hackle you can always break off the surplus. Often your soft hackle feathers will be too large especially if you are tying 16s and smaller. In that case there are several ways to ensure the hackle is in proportion to the hook. The simplest if you are starting out is to strip off feather fibres and tie them in on top and bottom by the head as you would a false hackle. 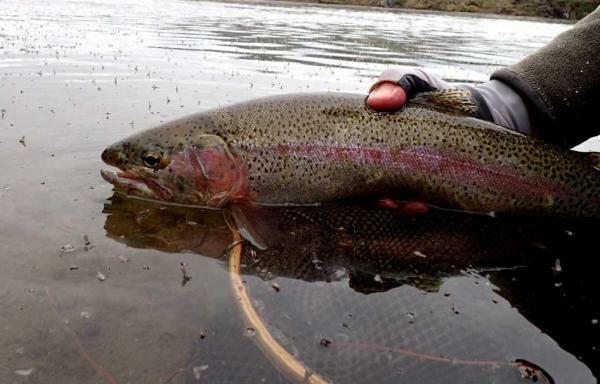 Never cut the hackles at their tips as you then lose all movement in the water. The scraggly feature of these flies is what makes them so attractive in the water. Fished upstream they resemble any dislodged midge, mayfly or caddis. Fished downstream the feathers tuck in to the body giving a streamlined rippling nymph look especially resembling swimming baetis nymphs. They are also versatile in that you can fish them on or in the surface. Mid-water to just below the surface they can imitate emerging or swimming nymphs/pupae or even indeed drowned insects of many species. And fished with a bit of weight on the bottom they can imitate all the nymph and larval life there. Try and fish them upstream dead drift and downstream the same but with a bit of 'mending'. In stillwaters they are a killer on the top dropper as a hatching 'Buzzer' (midge pupa) imitation again fished dead drift in the dam currents. As the francolin feather is so useful in many general situations maybe 'General Franco' for short for any fly tied with same be appropriate. Or again, maybe not! A rainbow and many others caught on the francolin/orange combination fished sub-surface during a heavy baetis hatch.See flies on the water.